Russia Will Launch a Cargo Ship to the Space Station Today! Here's How to Watch. A Russian Soyuz rocket carrying the Progress 71 cargo ship stands atop its launch pad at Baikonur Cosmodrome, Kazakhstan for a Nov. 16, 2018 launch to the International Space Station. Russia has prepared its next care package for astronauts onboard the International Space Station in a shipment scheduled to blast off today (Nov. 16). 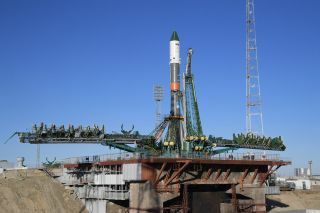 The cargo shipment, dubbed Progress 71, will launch on a Soyuz-FG rocket from Baikonur Cosmodrome in Kazakhstan. Liftoff will be at 12:14 a.m. local time on Nov. 17, or 1:14 p.m. EST on Nov. 16 (1814 GMT). A broadcast of the launch will begin at 1 p.m. EST (1800 GMT), and you can watch on Space.com, courtesy of NASA TV, or directly through the agency's livestream. Packed into that Progress capsule is 2.8 tons (2.5 metric tons) of supplies for the three astronauts currently living and working on the orbiting laboratory. Half the shipment is cargo and spare parts for the giant facility, but the cargo ship is also carrying fuel, oxygen, air and water as part of standard resupply procedures, according to NASA. The capsule will dock to the space station's Zvezda Service Module on Nov. 18 at 2:30 p.m. EST (1930 GMT). NASA will be livestreaming that maneuver as well, beginning at 1:45 p.m. EST (1645 GMT). Today's launch will be the first of a Soyuz-FG rocket since Oct. 11, when a rocket carrying two astronauts to the space station aborted shortly after liftoff. Those astronauts conducted an emergency ballistic re-entry and landed safely, but the failure means there are currently only three astronauts aboard the orbiting laboratory. The Russian space agency, Roscosmos, has successfully launched a slightly different version of the Soyuz since the failure. It's a busy week for cargo shipments: Tomorrow (Nov. 17), a Northrop Grumman Antares rocket is due to blast a second resupply mission to the space station, with liftoff from NASA's Wallops Flight Facility in Virginia scheduled for 4:01 a.m. EST (0901 GMT). That capsule will dock on Nov. 19 at 5:20 a.m. EST (1020 GMT).